Since the beginning of time, humans have been ambitious. We have built the great pyramids, written the Odyssey, constructed Versailles, and carved the Panama Canal. Humans are about getting things done. We set out goals and achieve them. This is where we should start in our telling of the history of SMART goals. In the 1960’s, research began regarding the power of setting goals and organizational performance. The first contextual event in the history of SMART goals happened in 1968. Dr. Edwin Locke published a seminal paper called “Toward a Theory of Task Motivation and Incentives”. In the paper, Locke established that appropriately set goals do result in superior organizational performance. In context of the history of SMART goals, the SMART methodology has only recently become a hot topic amongst executives. Leaders and managers are looking for a way to guide their troops to victory by laying out goals that move the company forward. To accomplish this, many have started to look toward SMART goal setting. However, as of recently, several interpretations have arisen about what the letters in SMART actually mean. For example, the “R” in SMART has alternatively been interpreted as Relevant, Result-based, Resourced, Resonant, Realistic, and Reasonable. It is important to note, while the exact definition of “R” is not critical, it should be meaningful and not redundant in a larger context. For example, “Achievable” and “Realistic” are close together in meaning. Therefore, that definition of “R” is not particularly additive. However, by interpreting “R” as Relevant, leaders add the dimension that the goals should conform with strategic direction. Otherwise, goals that are attainable and realistic may not actually move the organization in the desired direction. Imagine an 8-man rowing crew team in which everyone is in sync, but there is no coxswain. The team pulls hard, the boat juts through the water…and then they crash into the back. Rowing extremely hard was “Realistic”, but it just wasn’t “Relevant”. Over time, SMART goal setting has helped organizations of all sizes set and achieve their objectives. The main concept is: Be thoughtful about your goals. Make them matter. Ensure their clarity. Monitor their progress towards completion. People are motivated to attain things. Design the best goals that you can…and then turn your people loose. That’s our mantra here at AchieveIt! In 1981, George T. Doran published a work in the November issue of Management Review that extended upon Locke’s findings. Doran, G. T. (1981). “There’s a S.M.A.R.T. way to write management’s goals and objectives”. Management Review (AMA FORUM) 70 (11): 35–36. In this work, Doran laid out the main principles of SMART goals. He recognized that companies need to achieve goals and objectives, but often established goals were too diffuse to have a meaningful impact. He articulated in detail that goals are not amorphous, inarticulate things. Rather, they are measurable things that need to be achieved to move an organization forward. He expressed the first, cogent way to define, measure and ultimately achieve goals. This simplified, mnemonic concept helped solidify the notion of goal-setting for leaders and mangers across the globe. 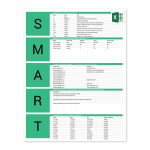 Download this SMART Goals template for a quick-reference guide that walks you through the steps to build your own set of S.M.A.R.T. goals, and start achieving success today.